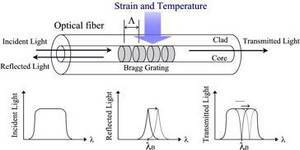 Fiber Bragg Grating Sensor (FBG) - Technology : Technical Information | LAZOC Inc.
To fabricate a FBG, photosensitive fiber is exposed to high intensity ultraviolet light, forming a periodic change in the refractive index of the fiber's core. This pattern, or grating, reflects a particular wavelength of light that is dependent upon the period, Λ, of the refractive-index profile formed in the core. In its most basic operation as a sensor, the modulation index within of the FBG is altered by an external stimulus, resulting in a shift in the wavelength reflected by the FBG. By measuring the shift in reflected wavelength, the external stimulus can be determined.